Ralph W. Moss, PhD was co-founder of the National Institutes of Health’s Office Of Alternative Medicine and also served as their advisor from 1991-2001. Dr. Moss was also Assistant Director of Public Affairs at Memorial Sloan-Kettering Cancer Center (MSKCC) in New York City when he unveiled a cover-up of positive tests with America’s most controversial anticancer agent, Laetrile. He was ordered by MSKCC officials to falsify reports. He refused. Instead, he organized an underground employee group called Second Opinion to oppose this cover-up. 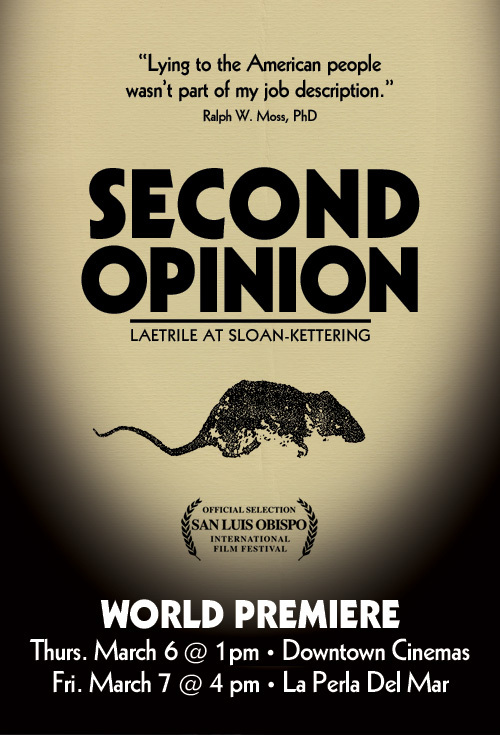 Eric Merola, the internationally award-winning director of the Burzynski Film Series, is proud to announce the release of his third documentary — Second Opinion: Laetrile At Sloan-Kettering — which takes you through a detailed journey of these shocking events. Ralph W. Moss, PhD has also simultaneously released Doctored Results — a new book and companion guide to this documentary. Past National President, American Cancer Society and Past Chairman, President’s Cancer Panel. Julian Whitaker, MD, Director, Whitaker Wellness Institute and Editor, Health & Healing Newsletter, Newport Beach, California. The story of Laetrile has a long history starting in San Luis Obispo (SLO) — making the World Premiere of “Second Opinion” in SLO a logical fit. Notice the photo below. SLO’s old pharmacy from the turn of the 19th century was owned and operated by Dr. Ernst Krebs, the original inventor of Laetrile. Ralph W. Moss, PhD — the hero of “Second Opinion” as well as the film’s director Eric Merola will attend both screenings and participate in a Q&A afterwards. Click here for more info on these screenings. SECOND OPINION was shot over the course of a year in various locations, including the historical Aldrich House in Providence, RI, New York City, and State College, PA. This documentary is the film Eric Merola has always wanted to make. The hero of our story, Ralph W. Moss, PhD, wrote a book entitled “The Cancer Industry”, which covers many of the experiences he describes in SECOND OPINION. Merola read the book back in 2007, and was so taken by Moss’ story, that it inspired him to direct his first documentary. Learning from the process of shooting two documentaries himself, Merola decided to step up the production quality on SECOND OPINION by hiring some of the industry’s top DPs and musical talent. And since all of his previous films had been self-funded, the financial success of the first two documentaries allowed Merola the ability to create his first top notch, well-funded film—SECOND OPINION. The story of SECOND OPINION is one of a whistle-blower who followed his conscience instead of his paycheck to do what he believed was morally right. It could have been about any subject, but the fact that it pertains to an unmarketable cancer therapy that was testing positively within the confines of America’s largest cancer research institution at the time, and then was forced to be suppressed for profit reasons by the highest levels of government, makes for a very timely and relevant story in a time of ever-increasing corruption and secrecy by both industry and government.